GRi Simulation: ISE Explorer AUV being recovered with a Hawboldt LARS.GRi Simulation: ISE Explorer AUV being recovered with a Hawboldt LARS. 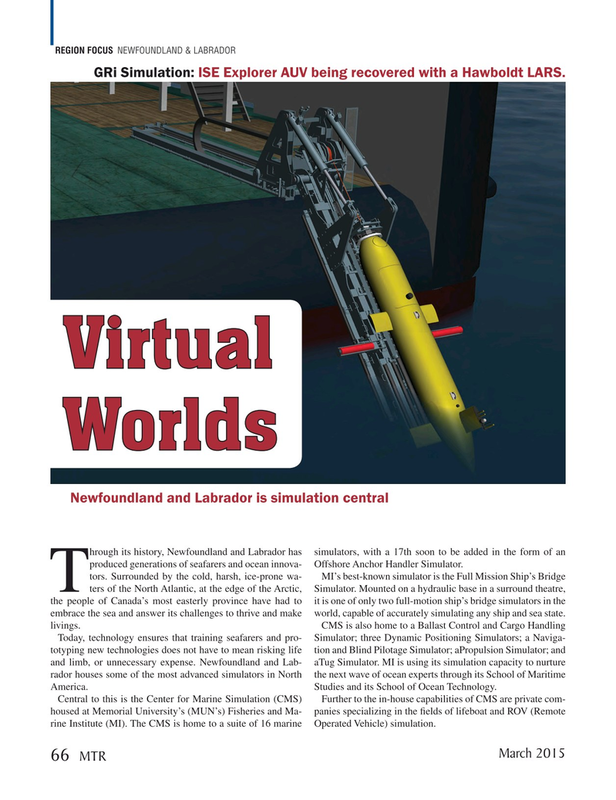 Newfoundland and Labrador is simulation centralNewfoundland and Labrador is simulation central hrough its history, Newfoundland and Labrador has simulators, with a 17th soon to be added in the form of an produced generations of seafarers and ocean innova- Offshore Anchor Handler Simulator. Tters of the North Atlantic, at the edge of the Arctic, Simulator. Mounted on a hydraulic base in a surround theatre, the people of Canada’s most easterly province have had to it is one of only two full-motion ship’s bridge simulators in the embrace the sea and answer its challenges to thrive and make world, capable of accurately simulating any ship and sea state. America. Studies and its School of Ocean Technology.